The New Zealand Roll is similar to the California Roll. 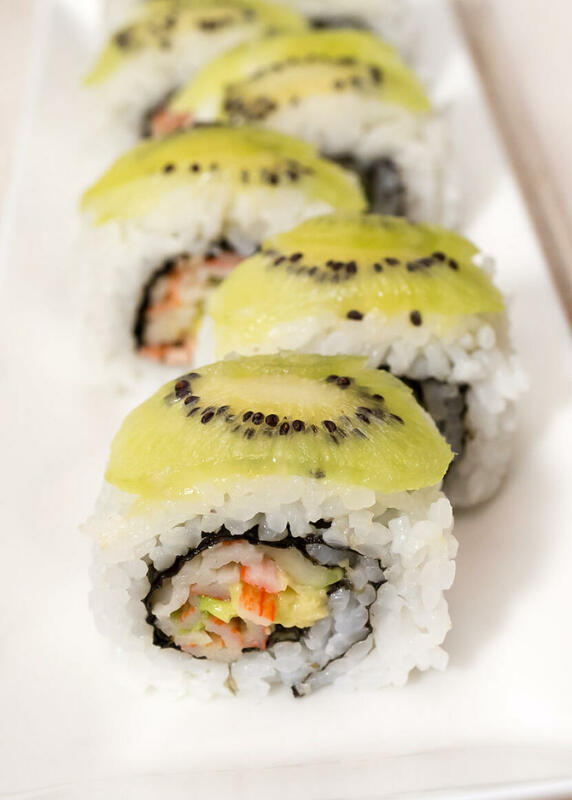 The only differences are that the roll is made with the sumeshi on the outside and covered with kiwifruit slices. If you’re a fan of sweet/savory combinations, you’ll love this roll. The fruit on top adds just a hint of sweetness that goes excellently with the savory California roll. Peel the skin off of the kiwi fruit, and slice into thin pieces. Spread the rice on the nori as usual. Flip the nori over so the rice is on the bottom and the nori is on the top. Place the imitation crab mix and avocado on the bottom edge of the nori. Roll tightly, making sure the rice doesn’t stick to the rolling mat. 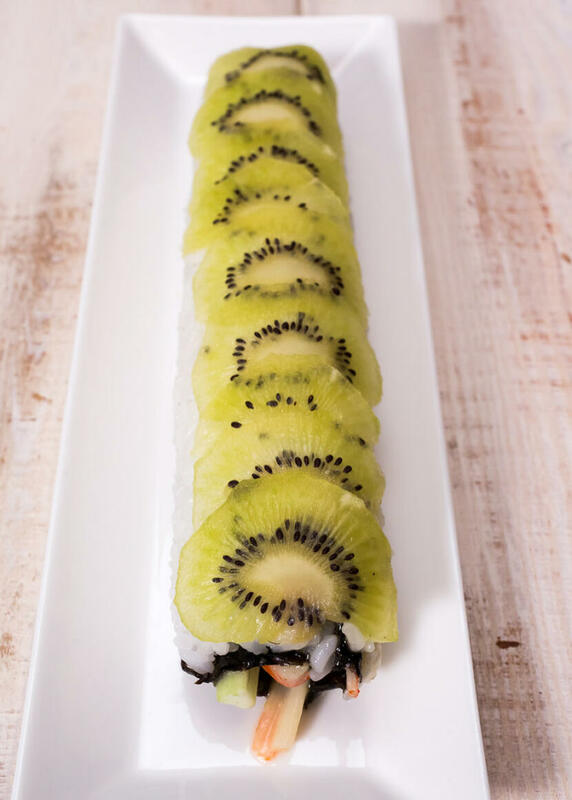 Once the sushi is rolled (with the rice on the outside), place the slices of kiwi fruit on the top of the sushi. 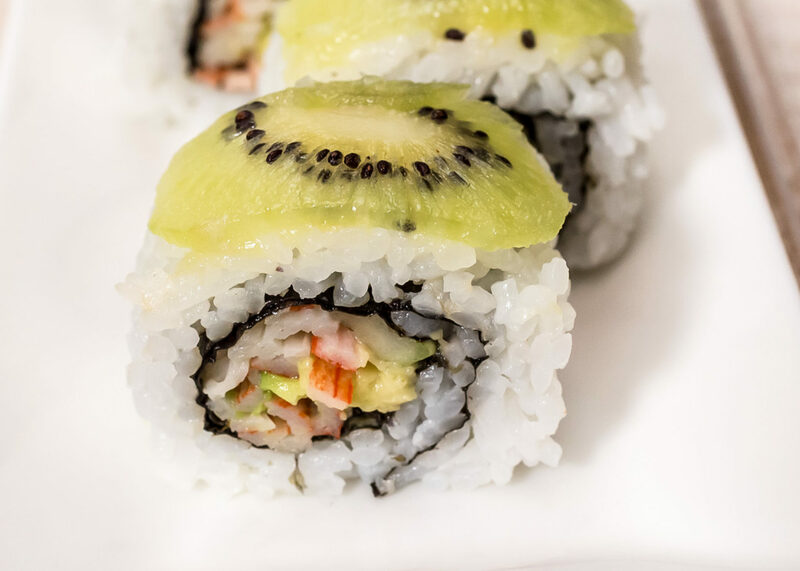 Using the rolling mat, press the kiwi fruit into the inside-out California roll, so it doesn’t fall off of the roll. Carefully slice into six or eight slices. Woohoo, I like seeing New Zealand things (as I am residing in NZ); but was alittle stunned to see “Kiwi” as an ingredient – It is one of our natural icons, the Kiwi Bird and some NZers can get abit touchy when you use their native birds to make sushi – it was only when I saw the pictures that I was reassured that these were not Birds, but Kiwi, the Kiwifruit. I’m glad you like it! Sorry to have scared you, I made the change you suggested! 🙂 Thanks for the feedback! I’ve never heard of putting kiwi on top of a roll, but it sounds like a great idea to get a different sweater taste added in. I can’t wait to try it! I have never seen fruit on sushi. That’s different, did you come up with that yourself? I’ll have to give it a try. BTW your tips have been very helpful, thanks! Allison love the website. The design is easy to use/looks fantastic. Great job. You might want to try using apple slices in one of your creations. Fuji/Granny apples have a nice sweetness, and make it a riceless roll. Rice seems to detract from the overall flavor. One quick tip, when making sushi rolls, always remember that less fish equals more flavor. Just want to clarify by what I meant by “less fish equals more flavor.” I meant how many different pieces you put into a creations, not the quanity of fish. Hope that’s clearer. Thanks Uncle D.!! 🙂 I’ll definitely keep that in mind. 😀 Thanks so much for the tips!!! Haha thanks Brad, I’ll make some sushi for you next time everyone is down here! Yeah, I’m definitely taking Uncle Dale’s tips, some fish sushi should be up soon! It is first time for me to see sushi with kiwi in my life. Very surprising and interesting. Good idea and pictures!!! Thats funny,,,,, because the same chef I know in La Jolla has been serving the same roll for years………..